Some of you may remember a post that I wrote a long time ago about the cute little potting shed/garden house that my DH designed and built for me. Yes, this is the same wonderful hubby that is building a shed up at our cottage, but that one will be strictly for him. I told him he should start up a side business making these, because I am certain there must be other ladies like me who would love a little getaway like this. We opened it up this past weekend. (We use it to store our patio furniture during the winter since it is not heated.) We scrubbed and swept and gave it a thorough spring cleaning. So I thought I would take some more pictures to share with you. Come on in and sit a while ~ Perhaps you would like light refreshment like a cup of tea or glass of lemonade? I got this angel fountain from the shop I used to manage. It was an extra one sent in error by the manufacturer, who told us to keep it instead of sending it back. Who am I to argue with that decision? The water creates such a soothing sound and is great to have running when the neighbor decides to mow his lawn at the exact time I am spending a relaxing moment in the retreat. These are a few of the pillows in my collection. They make the wicker loveseat all comfy and cozy ~ perfect for curling up and reading a good book. This chair is my all-time favorite and was made by an artist who sold her things through our shop. My favorite part is the little hand-carved chickadee sitting atop the back of the chair. I had this basket of flowers personalized specifically for the potting shed after reading that the word FOLLY means, "a building constructed strictly as a decoration, having none of the usual purposes of housing associated with a conventional structure. A folly originated as decorative accent in parks and estates and is used in the sense of fun or light-heartedness, not in the sense of something ill-advised." We used recycled vintage windows (and french doors) in the construction and the view is as pretty as a picture. Not much is blooming at the moment except for the bleeding hearts on this side and. . .
. . .blue columbine and a fragrant Miss Kim lilac out the window on the other side. I found this sconce at a flea market, rewired it myself and added the beaded shade for a touch of shabby chic elegance. An inspiration board for garden dreams. . .
And a cute little desk for writing or drawing. I bought the nest lamp and hand-painted the shade. Two little love birds sit in a flea market find cage. The color was perfect. . .I couldn't resist! That's all for today....stop back tomorrow for more photos! I would love to have a spot like yours. Thanks for sharing. Maybe one day I could have a shed as beautiful as yours. i would never leave!! heavenly. What a fantastic little world! You are blessed with such a wonderful hideaway! I love it all, Jeanne! Love your heavenly little hideaway, and that painted chair is amazing! It looks so heavenly! I'll take a lemonade, and I'd love to hang out and chat! what a wonderful place! Oh you are so lucky! Oh my gosh your potting shed is just to die for! I wanna move in! Love how you have decorated it. I always whished for a garden house or room like this but have not enough space in my small garden. So I try to make my deck my garden room with lots of shelves and tables, decorations etc. but I dream of a shed or something were I can leave all things all year whatever the weather is. 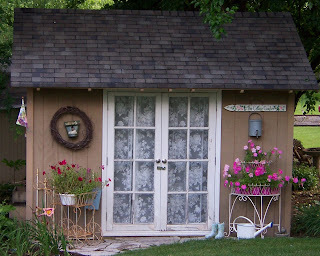 your shed is the little cottage I dream of turning mine into. What a wonderful DH you have. Your garden is lovely too. I love you cool little potting shed. I have always wanted to do that to mine. Actually I just got a new shed. But it is to small to decorate it. But I love the idea in theory.